Hard Cover, 128 pages, 9.25 x 12. Very nice collection of hundreds of beer labels from around the world, pictured in full color, and intermingled with photos of historic and contemporary breweries around the world. A visual delight! Also includes good discussion of various breweries, their history, etc. 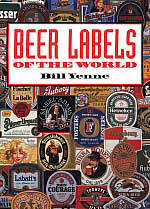 One of a series of fabulous books by beer writer Bill Yenne.